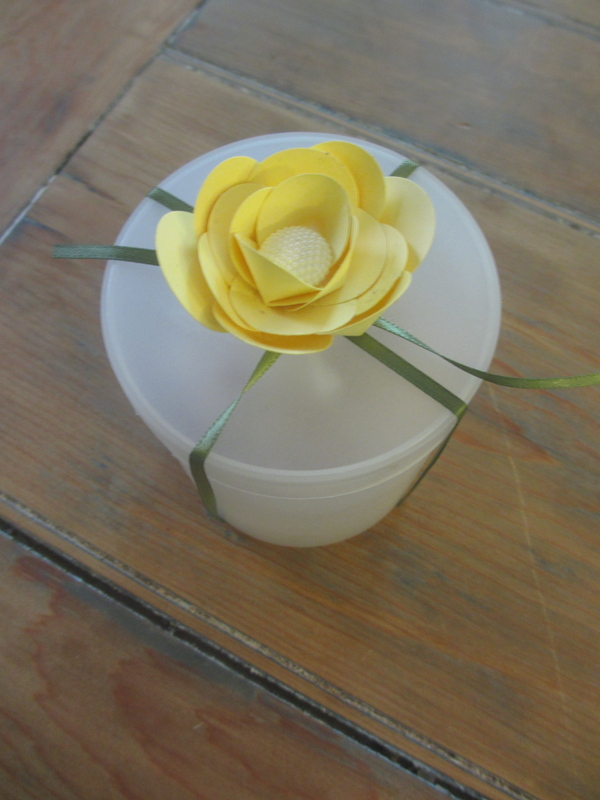 I’ve always admired the paper flowers that I’ve seen around the internet, but I’ve never tried to make my own until recently. I have to admit, I started this project with a severe lack of supplies. Sure, I had different types of paper, scissors, and all of the craft supplies you would want for such a task, but I did not have my computer by my side to look up similar projects for inspiration. Instead, I tried a few different techniques until I found one that worked. I’m very happy with the results you see below and was impressed at how quickly the flower took shape and came together. 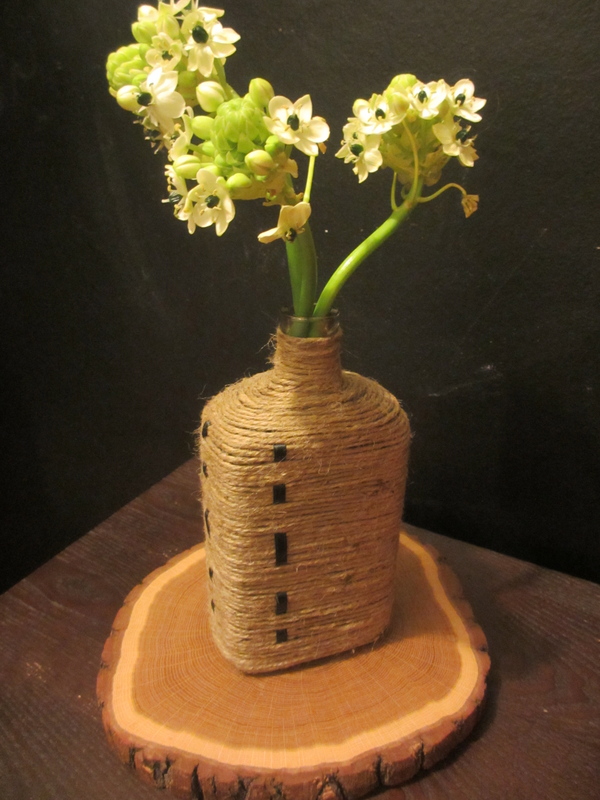 So far, I’ve only used one flower to top a gift, but I could see a group of them being used to decorate a tabletop, or a few tucked into the corners of a bookcase to add a little pop of color. They’ll always be in season, so I’m sure many more paper flowers will be blooming around here soon. 1. Use a squeeze punch to cut round disks from the colored paper. I used about 15 circles for the flower pictured above. 2. Use scissors to cut a slit into all but one disk of paper from the outside edge to the center (see photo in slideshow below). 3. Hold a disk in your hand and use your fingers to wrap it into a cone shape. Secure the edges with a dot of glue and let dry (see photo in slideshow below). Do this with all of the disks. 4. Glue one cone to the base of another cone, allowing them to overlap just slightly (see photo in slideshow below). Secure with a dot of glue and add more cones, one-by-one, to your flower, building out as you go. 5. Once your flower has reached your desired size, glue the one uncut disk that was set aside to the back so you have a smooth bottom. 6. Glue a decorative button into the center of the flower and let dry. Use as desired. SWWU Tip 1: Curious to know what’s inside the box above? It’s a personalized wood block created to commemorate a baptism. Check it and other great gift ideas out at the ekm43 shop on Etsy. SWWU Tip 2: Looking for an easier way to adorn the gifts you give? Check out this cascading ribbon bow. Got Time To Make A Clock? 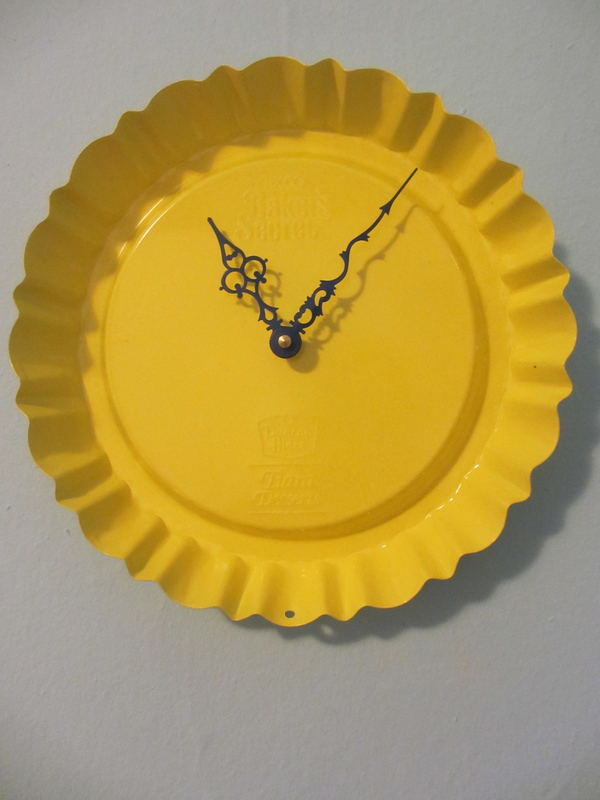 Brian and I have been on the hunt for a colorful kitchen clock for quite some time. Nothing we found was quite right though. They either had visible power cords, made too much noise or just didn’t fit in aesthetically. Finally we decided to stop looking for the perfect clock and just make our own! Once we had all the pieces in place the clock came together a lot easier than we expected. It’s made from an old Duncan Hines dessert pan that I picked up at an antique store for only $2. A quick coat of Rust-Oleum Painter’s Touch paint (in Sun Yellow) transformed the tattered pan into a bright, cheerful piece. A Clock Movement Kit provided the working parts we needed. The arms got a coat of Rust-Oleum Painter’s Touch paint (in Deep Blue) to provide some contrast. We drilled a hold in the center of the pan and followed the instructions that came with the clock kit to assemble everything. We’re both quite pleased with the finished product and can’t wait to find something else to turn into a clock in another room. After all, it doesn’t take that much time. SWWU Tip: Like the dessert pan we used? I just did a quick search on Etsy and eBay and found a few, ranging from $6 to $20 each. Try searching for the term “Ekco Bakers Secret Duncan Hines,” and see what you can find. 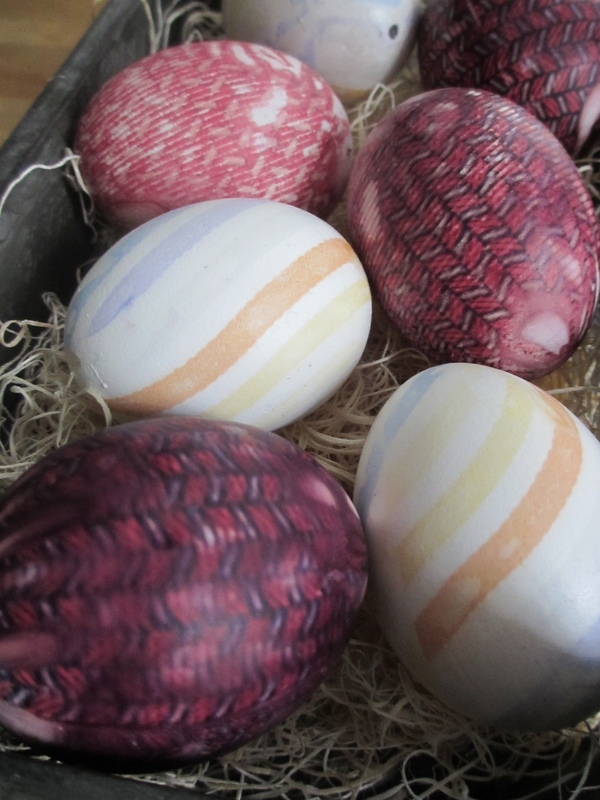 Silk-dyed eggs have been all over the internet for the past few years. It was a technique I always wanted to try, but I never had excess silk, ties or scarves hanging around. Then, when Brian and I started cleaning out our closets we found some real gems. And by gems, I mean hideous ties. They had to go, and I knew just what to do with them! 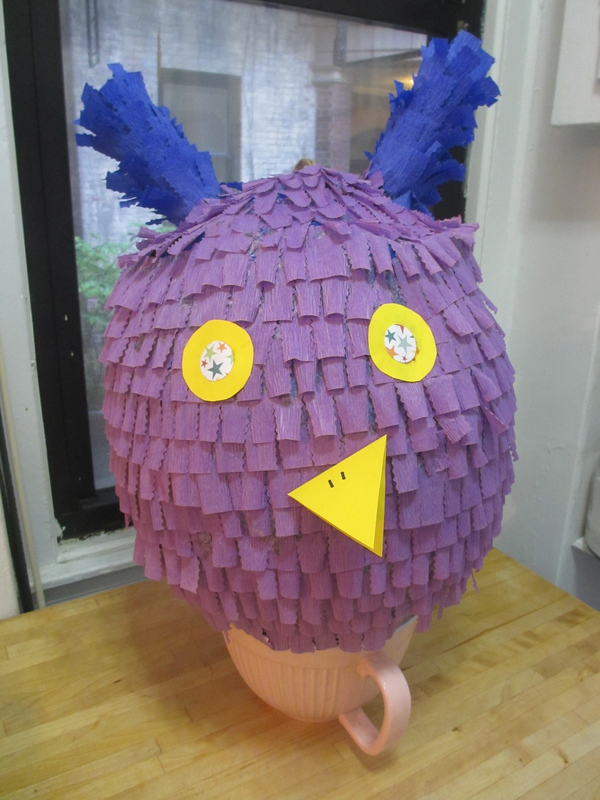 The project was pretty simple, but it is time-consuming. We ran into some trouble with two of the ties we used; I suppose they turned out not to be 100 percent silk, which is necessary. The ones that did work, are quite unique though. We’ll definitely be giving this another shot next year, too. 1. First blow out your eggs. To do this, slightly hammer the smallest of your nails (the smaller the better) into one end of your egg. Remove the nail, then work the next larger nail into the same exact spot. Finally, finish with your largest nail. Repeat this process at the other end of the egg, so you have a hole on the top and one on the bottom. Take your longest nail and poke it into each hole several times, carefully moving it around to help break up the yolk. Place a straw over the top hole and blow into the opposite end of the straw. If saving your eggs, do this over a bowl. If not saving your eggs, it helps to do this over the sink with running water. Once all of the whites and yolk have come out of the egg, rinse it under running water and set it on a towel to dry. Repeat with remaining eggs. 2. Carefully take your ties apart, starting with the back seam. Cut squares large enough to wrap around the eggs, with a bit extra on each side. 3. Wrap the fabric, top-side-in, around each egg. Secure each end as tight as you can with a twist tie or rubber band. 4. Cut your cotton cloth into squares large enough to wrap each egg in. Wrap the eggs and secure with a twist tie or rubber band. 5. Fill a large nonreactive pot with cold water and add the vinegar. Place the wrapped eggs inside the pot. If eggs are floating, top with a heat-safe plate (to help keep the eggs submerged). Bring to a boil, then reduce to a simmer for 20 minutes. Turn heat off and let eggs sit in water for 30 minutes. Use tongs to remove eggs, let cool, then unwrap. SWWU Tip 1: Wrap your eggs as tightly as possible. Any spot where the fabric is not touching the eggs will result in the pattern not being transferred. It also helps to wet the silk a bit before wrapping your egg in it. SWWU Tip 2: Any type of silk should work for this project. In addition to ties, look for scarves or scraps of fabric at thrift stores.